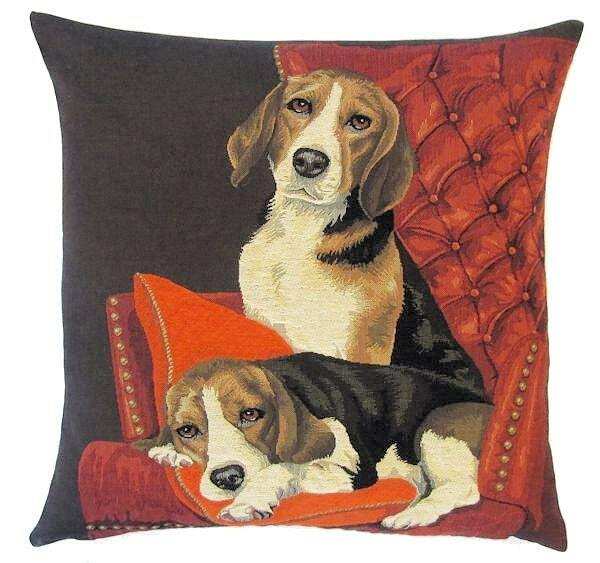 This tapestry cushion is part of a line of three cushions showing dogs lying on an antique sofa. It was designed by Sabine and is woven on a jacquard loom. Tapestry design is a craft that only a few master and Sabine is one of them. She starts from a high resolution image, which she scans and then comepletely reworks it until it is ready for weaving. Averagely, the "cleaning up" of an image takes between 12 and 16 hours. Respect ! Darling beale pillow with such realistic looks on faces---great colors on all these pillow covers. Love this pillow cover. It is of very high quality and looks beautiful. I followed the recommendations and stuffed it with a 20x20 insert which fills it perfectly. Ein Bild sagt mehr als Worte . ... Vielen Dank für dieses wunderschöne Kissen . Beautiful and quality pillowcase made with care and attention to detail. Also, it made the transatlantic journey within one week! Thank you very much!